One of the 66 bundles of undeveloped film, which total an estimated 1,200 rolls, all shot by a single photographer in the 1950s. Far too much for Levi Bettwieser to develop himself. Levi Bettwieser is the founder and film technician for The Rescued Film Project – an archive of images from ‘lost and forgotten’ rolls of film, sourced from all over the word. 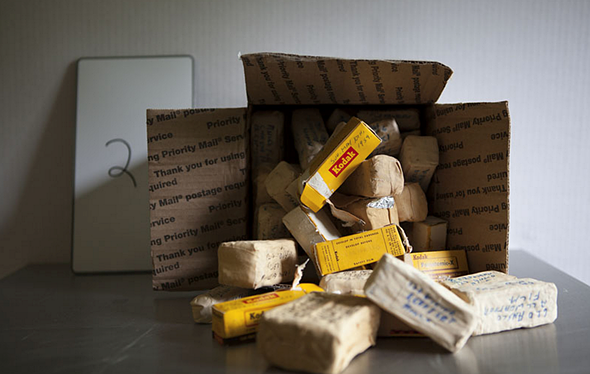 Last year, Bettwieser acquired 66 packages of undeveloped film from the 1950s, totaling an estimated 1,200 rolls. Each package is made up of several rolls of undeveloped film, meticulously wrapped in aluminum foil, newspaper and athletic tape and as Bettwieser explains, ‘this is way more film than I can process myself.’ The single roll that he has developed shows some degradation but has yielded usable images. Blue Moon Camera in Portland has agreed to take on the task of developing the rest of the unprocessed film, but even with a discount, processing so many rolls is going to cost a lot of money. Bettwieser has launched a funding campaign on Indiegogo.com, and at time of writing, his team has raised roughly a third of the total funding goal of $15,000. If you’re interested in this project, you might enjoy reading a series of articles that we published in 2014.